Another small mystery solved! Nellie Davison and Henry Howell were indeed married in London, England - just as dad remembers. I found an entry in "The England and Wales Civil Registration Index" which shows they were married in the quarter ending June 1900 - "Pancras District, London, Middlesex, England." She appears by her full name in the index as Ellen Minora Davison, and he appears as Henry Howell. This further confirms the family stories that they were married in England and also confirms the entry in the Clopton Family Association Genealogy which says married "London". St. Pancras is the name of a place in London. However, it is no longer very much used as a name for the district, having been largely superseded by several other terms for overlapping places. St Pancras was originally a medieval parish which ran from close to what is now Oxford Street north as far as Highgate, and from what is now Regent's Park in the west to the road now known as York Way in the east, boundaries which take in much of the current London Borough of Camden, including the central part of it. However, as the choice of name for the borough suggests, St Pancras has lost its status at the central settlement in the area. The district now encompassed by the term "St Pancras" is not easy to define, and usage of St Pancras as a place name is fairly limited. 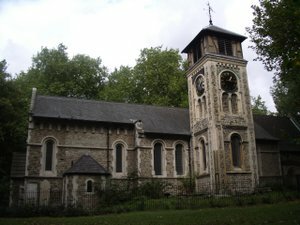 Old St Pancras Church and its graveyard have links to Charles Dickens, Thomas Hardy, and the Wollstonecraft circle. Immediately to the north of the churchyard is St Pancras Hospital, formerly the London Hospital for Tropical Diseases. St Pancras is one of the best known railway stations in England. It is currently being extended and is due to become the new terminus for the Eurostar services through the Channel Tunnel in 2007. Since Nellie and Henry appear in the US Census taken June 15, 1900 living in Marietta, GA "married for 0 years", they must have departed for America by ship shortly after their marriage. The spelling of Margaret Elizabeth "Murchie"'s surname, to the dismay of many present, continues to be a topic of discussion at family reunions. Boyer family lore says that maybe the spelling was really Murphy but misspelled by well-meaning immigration officials. Here is a new hypothesis on the Murchie/ Murphy spelling issue - MURCHY. If correct then it is likely that we've located a 'new' ancestor - William Murchy, father of Margaret Elizabeth Murchy who married John William Carlin. This makes William a Great Grandfather to Bill & Evelyn Boyer. William Murchy was born in 1831, in Maine - his parents were born in Scotland. By 1862 he was living in PA, as this is where his eldest child, "Minnie" was born. He appears in a special supplement to the U.S. Census as having served the Union Army in the "war of the rebellion" (U.S. Civil War) from 1862 to 1865 in "Ordinance." By 1870 he is living in the Frankford Arsenal, Bridge St., where he was a U.S. Soldier, a private specializing in "Ordinance", and where he spent at the very least 10 years with his family. Bill Boyer and Wendy Hinsdale Smythe agree that #1 is John William Carlin, Bill's grandfather, and #7 Elizabeth M. is Bill's mother, Wendy's grandmother. Now, if you take a small leap, maybe these Murchy's are the Boyer's Murchie's/ Murphy's? And just maybe they are relatives of #2 "Margaret E." (Margaret E. Murchie/Murphy Carlin.) From the men's ages, they look like they could be her brothers....so that sends us on a brand new quest looking for #2, #8 and #9 living together as a Murchy family in an earlier census..
Bill Boyer remembers his mother's Aunt Minnie from when she was probably in her 90's in the 1950's - If this is correct she is #3 (Minnie) in the 1870 census and #3a (Amelia) in the 1880 census. Minnie would be 96 years old in 1958. Laura (who Bill also remembers) #6a is Minnie's younger half sister by 15 years so she would have been 93 in 1970 (but we don't at this point know how long she lived). Independently and prior to this research, Bill Boyer mentioned that "Mr. Murchie/ Murphy had three daughters: Laura from one wife, Margaret and Minnie from another wife." - all those names also appear above, and the ages make sense if you assume that Annie, age 20 in 1870 is the second wife. The U.S. Census evidence is quite compelling to say that John Carlin born 1822 in Canada, occupation "Morocco Dresser", and his family are indeed ours. The census indicates "mother tongue: Irish."